Zodiac signs are something that intrigues the masses. Everybody loves to know their special attributes inherited from their respective zodiac signs. Well, along with the western zodiac, the Chinese Zodiac has also gained momentum as it is something that raises curiosity in everybody. Comparing their western zodiac characteristics to their Chinese zodiac characteristics to check for any difference is a common intrigue that lures people towards the Chinese Zodiac. However, the Chinese Zodiac is completely different from the western zodiac. You can learn all about it by reading the introduction to the Chinese Zodiac which is ruled by 12 animals one for each year and it is a 12-year cycle. If you want to flaunt your zodiac sign in your own cool and super stylish way, then there is nothing better than the Chinese Zodiac range of RMC Jeans. They are unique, elegant and with their distinctive hand embroidered zodiac designs over the pocket, they will instantly make you stand out in the crowd. Last time we talked about the first zodiac sign, the year of the rat. 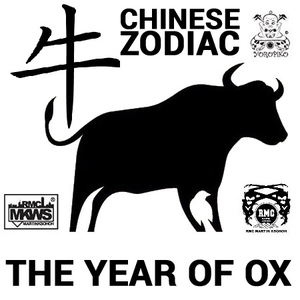 Ox is the second sign in the Chinese Zodiac. You might be wondering how the ox came in second while rat came in first, well check out the introduction to the Chinese Zodiac to know all about how rat outsmarted others to gain the number one position. For those born in the year of the ox, RMC brings the . A hand embroidered design of the patron deity of the zodiac sign ox, Kokūzō Bosatsu, can be seen on one of the back pockets of this raw selvedge denim. This deity symbolizes the vast and the boundless wisdom that leads towards enlightenment. This is the deity of wisdom and compassion and those born in the year of the ox are lucky that they have the deity as their patron as they will be blessed with intelligence and compassion. He is also the bestower of wishes and holds a wish-granting jewel in his left hand which can be seen in the intricately hand embroidered design of the deity on the jeans pocket. In the other hand, he holds a sword which signifies wisdom cutting through ignorance. He is sitting in a meditative posture on a lotus. Lotus is a symbol of purity and detachment from the worldly desires. On the other pocket is the kanji word of the deity. The years of the ox are 1913, 1925, 1937, 1949, 1961, 1973, 1985, 1997, 2009, 2021, 2033, etc. The positive attributes of those people born in the year of the ox are honesty, patience, industriousness, cautious, strong-willed, level-headed, and persistent. The negative attributes are being obstinate, inarticulate, prudish and distant. Well whatever be the attributes, the one attribute that the people of this zodiac should not miss is the sense of fashion. So go ahead and add this awesome pair of jeans to your collection and flaunt your zodiac sign in style.